Stiga game orders placed by 2 PM EST ship same day. Occassionally we can extend this time to 4 PM as it depends on our truck pickup. Call us if to verify if you have a last minute order that must ship quickly. Nobody is faster than we are! Most orders ship within 24 hours. Please note that the above map only applies for Stiga game orders which are shipped by FedEx Ground. (Small part & team orders ship through the US Postal service so the above map will not apply). Football game, Baseball games and Snowracers are drop shipped and make take an extra day or two. Carrom games ship by freight delivery so the above map will not apply. Delivery times above are calculated in business days and do not count Saturdays, Sundays, or holidays. Example: If we ship on Monday and you live in the 2 business day zone, your package should arrive Wednesday. If we ship Friday and you live in the 1 business day zone, your package should arrive Monday, the first business day after the weekend. Fedex does not pick up from us on weekends. While FedEx Ground generally runs right on schedule, delivery times above are approximate and are never guaranteed. Weather delays are always possible. If you have a time sensitive order and need “day definite” guaranteed service, please upgrade to FedEx Express. Attention “Purple Zone” Customers – orders placed on Saturday and Sunday will ship on Monday. But you will not receive your package until the following Monday. You are in the 5 business day delivery zone. The 5th business day after a Monday shipment is the following Monday. This is because FedEx is closed on the weekend. Please keep this in mind if you have a time sensitive order. We do not assume any responsibility for ground or US postal service delays. We do not issue shipping refunds for Ground or USPS service delays. 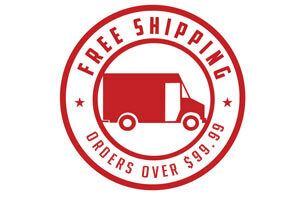 Guaranteed Rush delivery is available through FedEx Express or Express Mail. Please contact us for details.